Arsenal are to complete a deal for 16 year old starlet M'Baye Niang, according to reports from France. The Caen striker is considered to be one of the hottest prospects to come out of France for several years. The Gunners have already agreed a fee with Caen for the player, and Niang is expected to go out on loan for the 2011/12 season - perhaps back to Caen. 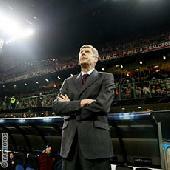 Arsene Wenger has made his move early and the fee is believed to be around 1m GBP.